Price includes $3.50 for shipping and handling. Hoagland's story reminds us that everyday heroes are found in the home. I want to start by saying I really loved the titles of the chapters in this book, each a phrase about time, so clever! . 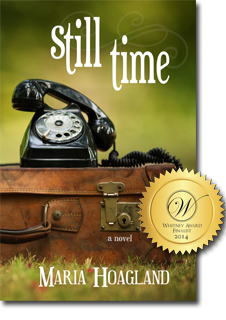 . . ​Maria Hoagland is a master at crafting characters that you care about in situations that feel real. This is a fun book that you won't want to miss! Still Time is an insightful novel that sheds light on the plight of "the sandwich generation," those among us working, raising children, and caring for a parent (or parents!) with Alzheimer's or other serious health concerns. . . ​ The characters are multidimensional, the dialogue and subplots believable, and the writing clear and uncluttered. Well done. I also learned a lot about the Mormon Church, which I haven't had much exposure to. Still Time is an excellent read for anyone curious about Alzheimer's or seeking validation of his or her role as caregiver. You are quickly pulled into the story...wanting to know what happens next! In life we have a beginning time, a middle time, and an end time.. It is in the middle time that Alyssa finds herself now... The middle time of life.... AND the middle time of care-giving... Still taking care of her children...and now taking care of her parent (her mother-in-law). . .
Wishing she could go back to a simpler time... She realizes that this is her time to truly take care of her family...immediate and extended. But that doesn't make this time an easy time. A FANTASTIC READ! You will chuckle, weep, and rejoice with Alyssa and her family.